Lorry Chen has a passion for promoting access to healthy food. “I wanted to solve world hunger,” she recalls of her time in dietetic school at Western University. For 28 years, she’s been a clinical dietitian at Holland Bloorview, initially working at our Bloorview site. She now works with our brain injury and orthopedic and developmental units, as well as in an outpatient nutrition clinic. We spoke about how she chose her career, and an instrumental preceptor at the Hospital for Sick Children who had Lorry put in her own nasogastric feeding (NG) tube, so that she’d understand what it felt like for patients. BLOOM: How did you get into this field? Throughout school, English was my weakest subject. My guidance counsellors in both elementary and high school said I don’t think you should aim for university. Luckily, I hung around with great people, and all of my friends were aiming for university and said I should try for it. I was the first one of my siblings to go. I initially took science. BLOOM: How did you move from your training to working with children? Lorry Chen: After a four-year degree, you have to apply for an internship, or you can’t become a registered dietitian. I did my internship at SickKids and I loved it. Lorry Chen: I learned so much. The dietitians there were so dynamic. My first clinical rotation was in cystic fibrosis. I had two lovely patients who made me reindeer and Santa magnets when they were doing crafts. I was at SickKids when they discovered the cystic fibrosis gene. Talk about being in the epicentre of discovery! And that spawned my passion for research. BLOOM: What did you do after SickKids? Lorry Chen: The internship was for a year. After that I got married and then I typed and hand-delivered resumés to all of the hospitals in Toronto. I had to take the bus everywhere. I applied to North York General and a friend of mine said Bloorview is just down the street, you can walk there from North York. So I dropped off my resumé and voila—I got an interview and the HR person hired me right after. I’ve been here ever since. BLOOM: What is a typical day like? Lorry Chen: It’s changed so much from 1990 to now. In 1990, I might have one or two patients who were on g-tubes. There were no NG tubes. Now, at any time, I will have five to 10 patients who are on g-tubes or NG tubes. The complexity of our children has increased. Most of my patients have a tube through their nose. BLOOM: I’ve heard that those nose tubes are extremely painful to put in. Lorry Chen: When I was doing my cystic fibrosis rotation at SickKids, the dietitian felt we needed to experience what it was like to place one, so that we could have empathy. BLOOM: That is so smart! Did you put them in for each other, or on yourself? Lorry Chen: We did it ourselves. It was so hard. I thought I was going to gag and throw up in front of my preceptor and everyone else. That’s why I can relate to an adolescent who needs an NG tube. I’ve put one in myself. Also, before I recommend any kind of feed, I taste it myself and I have my students taste it. BLOOM: So feeds kids would get by tube? Lorry Chen: Yes, because sometimes you burp, and then you will taste it. I want to be able to tell them if it’s not the most pleasant taste. BLOOM: What’s the greatest joy of your job? Lorry Chen: Taking the NG tubes out! Last week I had two come out. It was the best week ever. 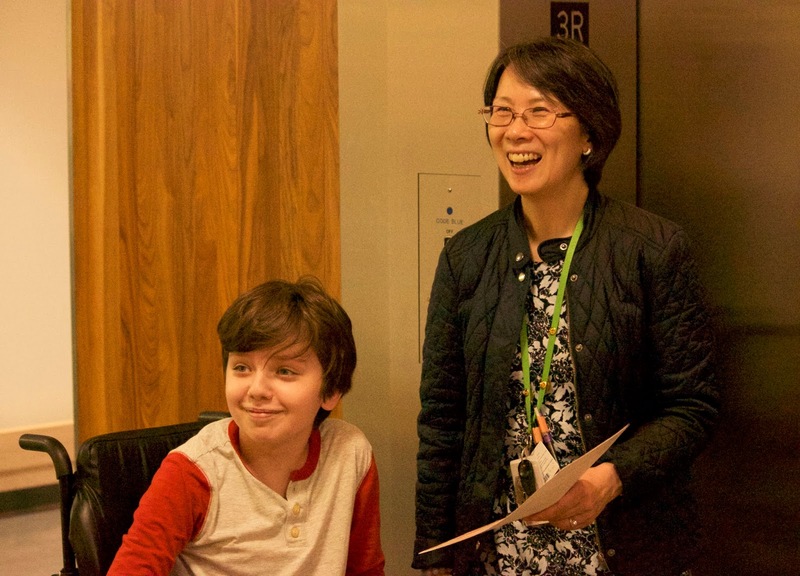 The patients and the parents were over the moon. It was a gold-star day. BLOOM: Besides your work with tube feeding, what other type of work do you do? Lorry Chen: We’re big on the clinical practice guidelines on bone health. Often I’m asked to make sure if a patient is at risk—especially if they have a spinal-cord injury—that they have appropriate calcium and vitamin D intake. Another part of the job is working with children who are too skinny or too heavy. BLOOM: I was on a panel at a Food Summit on Monday, and it was for food centre staff who work with people who can’t afford to eat at all, or to eat well. It got me thinking about our families, who are often strapped financially with all of the extra costs of raising a child with a disability. Is that an issue for inpatient families you work with? Lorry Chen: Oh yes. Patricia Rebia, the clinical assistant in our nutrition clinic, and I have been chatting about applying to the No Boundaries fund to provide tools to families about how to eat nutritiously on a very tight budget. BLOOM: Perhaps we could also develop a partnership with a food centre locally, or with our foundation. What is the greatest challenge of your work? Lorry Chen: When you work, and put in your best intentions with a client, but things aren’t going the way you envisioned. For example, if a child has a huge food aversion and he’s not eating. 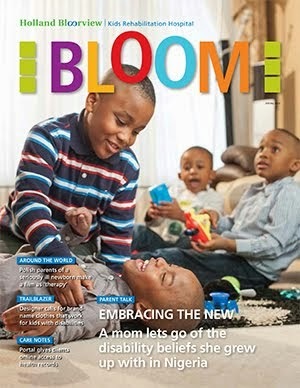 BLOOM: When my son was an inpatient here, he went on a hunger strike. He was in a body cast and was taking so many meds and was in pain. So he refused to eat. Lorry Chen: Literally, there are clients that go on hunger strikes. Luckily we can give them an NG tube that provides nutrition, but we want a happy balance with oral intake. Sodexo as a group have been very responsive to some of the food requests we’ve made. Sometimes I’ve brought in some of my kids’ toys from home, if a child responds well to positive reinforcement with toys. One thing I do communicate with caregivers, when a child won’t eat, is that ‘He’s the captain of the ship. We’re just passengers. We have to let him lead.’ Choosing whether to eat is one of the only things children have control of in hospital. BLOOM: That’s right. What emotions come with the job? Lorry Chen: The two extremes. Wonderful joy—when I got to take out two NG tubes last week, I was dancing down the hallway. Stress—when you’re grappling with what can I do to help a child, because the things you’re trying aren’t working. BLOOM: How do you manage stress? Lorry Chen: I’m an exercise fiend. I’m at the gym at 5:30 in the morning. My husband and I go. He kicks me out of bed. We go to a cycle-fit class. Then I take a shower and come to work. On the weekend I do yoga. Exercise, absolutely, is my stress relief. BLOOM: What kind of qualities does someone need in your role? Lorry Chen: As dietitians, we tend to be very precise—sometimes too precise. I’ve learned that a little flexibility is a good thing. Sometimes, when there’s an emergency, you have to come up with a solution that may not be ideal, or might have flaws to it, but you do the best you can with a solution, while mitigating all the risks. BLOOM: You must be good at explaining things. Lorry Chen: The car is a great analogy for the body. Everyone knows how a car works, so they understand that food is like fuel for your body. When kids say they don’t like breakfast, I tell them to think about how their engine has been idling all night, and when you put your foot on the gas, but the tank is empty, you stall. I tell them breakfast can be different things to different people. It could just be a glass of milk, or a piece of toast. BLOOM: If you could change something in children’s rehab, what would it be? Lorry Chen: Always the resources available to our families. Here I think we’re well supported, but in the community, I often find that there’s not enough. I wish there was a barometer that I could use to assess how much support a family needs, and then be able to give it to them. BLOOM: If you had to give yourself advice on your first day, but from where you stand now, what would you say? Lorry Chen: Two words: patience and flexibility.